Born in Munich, Germany, William Lamprecht (1838-1922) showed artistic talent as a young boy, and by his teen years was a pupil at the Royal Art Academy in Munich. While in his mid-20s, Lamprecht’s talent was brought to the attention of Abbot Wimmer, a Benedictine, who recommended the young artist to the Benedictine monks in Newark, New Jersey. They in turn invited Lamprecht to paint a series of pictures of the Life of the Blessed Virgin in their Abbey church in Newark. In 1867 the painter moved to Cincinnati, Ohio, and with one of the local Benedictine priests founded the Christian Art Society. 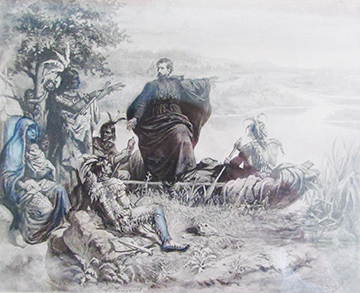 It was at this time he painted “Marquette Crossing the Mississippi.” This was acquired by the Jesuit priests and hung for a time at Marquette University. 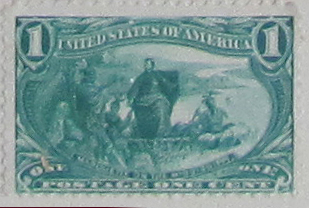 When the United States Post Office was looking for subjects for a series of stamps to commemorate the Trans-Mississippi Exposition held in Omaha, Neb., in 1898, Lamprecht’s painting was selected to be used on a one-cent stamp. In the early 1870s, Lamprecht returned briefly to Germany, but came back to the United States by 1875 to begin a 26-year period fulfilling commissions around the country. He first worked in New York City in several Jesuit churches as well as at Mount St. Vincent-on-the-Hudson, the motherhouse and academy of the Sisters of Charity of New York. In Cincinnati he did paintings at St. Joseph’s Church, Lynn Street and St. Louis Church at 8th and Walnut streets. 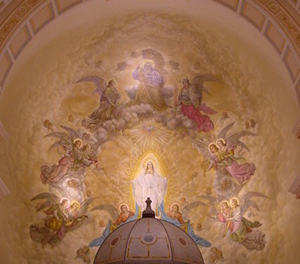 The artist’s last work in the United States was a great mural in the apse of the chapel of the Sisters of Charity at Mount St. Joseph, Ohio. According to S. Eveline Dee, “Early in January 1900, [she] and Mother Sebastian Shea went to New York to engage artists for the interior decorations of the new chapel at the Motherhouse. Mr. Wm. Lamprecht, famous New York artist, who was then engaged in work on several churches there ... was finally persuaded to paint the mural decorations.” According to S. Eveline, Lamprecht painted the mural above the main altar and the four medallions, St. Ambrose, St. John Chrysostom, St. Thomas Aquinas, St. Bonaventure, and the monstrance in the dome. During the months it took him to complete his work at the Mount, “he assisted at daily Mass and often spent considerable time in prayer. He was deeply religious.” The palate and brush he used for this painting are displayed in the case under the St. Vincent statue in the chapel. In 1901 Lamprecht and his family returned to Germany where he continued to paint and write poetry. World War I brought about financial reverses and privations for his family. He died on the feast of St. Joseph, March 19, 1922.